Health Care Bill Relevant In Montana Special Election : Shots - Health News Health care is on the minds of many potential voters in Montana, but the House health bill itself is unlikely to sway entrenched Republican voters in the special election next week. 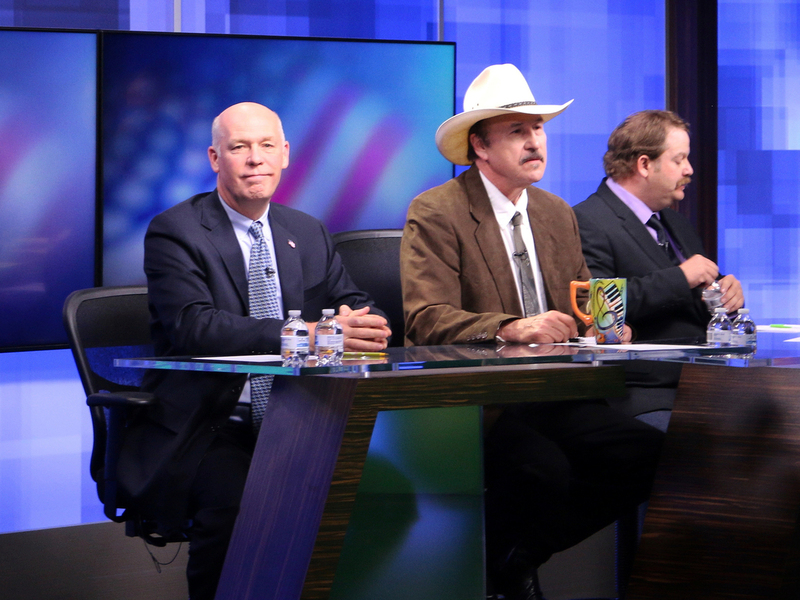 The three candidates, from left, Republican Greg Gianforte, Democrat Rob Quist and Libertarian Mark Wicks, who are vying to fill Montana's only congressional seat. Many Democrats are hoping the GOP health care bill that narrowly passed the U.S. House of Representatives is going to push political momentum their way, and result in big gains in the 2018 midterm elections. A special election next week in Montana may be an early test for this theory. President Trump won Montana by 20 points in the November 2016 election, and the May 25 special election is being held to replace the state's only congressman, Rep. Ryan Zinke, whom Trump nominated to be interior secretary. Montana resident Jim Lynch plans to vote for the Republican candidate, Greg Gianforte. Lynch is a member of the Glacier Country Pachyderm Club and members get together once a month in Kalispell, Mont., to talk about advancing Republican values. Lynch says health care is a top issue for him. He hates the Affordable Care Act. He's 63 and says he maintained good health insurance coverage throughout the Obama administration. But, he says, "There's a lot of people in my shoes who aren't that lucky. I do know, personally, that they've seen huge increases in health care costs, to the point that they don't even have it anymore." Indeed, people who are 55 to 64 can be charged as much as three times what a younger person can be charged for health insurance. Subsidies are available based on income, but older people may earn more than young people just starting their careers. Under the GOP bill that's now before the Senate, however, older people can be charged five times as much as younger people, and the subsidies are decreasing in aggregate. Lynch says he doesn't think the House health care bill is perfect, but he's confident that, as President Trump shepherds it through Congress, it will be modified into something much better than the Affordable Care Act. About a hundred miles south in Missoula, Mont., restaurant owner Molly Galusha dreads the idea of Obamacare being repealed. She says the current health care law's subsidies have made it possible for her employees to afford health coverage on the wages she can afford to pay them. Galusha is 62 and gets her health coverage through her husband's job. She says she doesn't know what they'd do if their insurance went away. "We're old and broken," she laughs. The Affordable Care Act's protections for people with pre-existing conditions are also likely to affect older people, because the likelihood of having a pre-existing condition increases with age. "We are uninsurable as a couple, so we're very grateful," Galusha says. Republican candidate Gianforte says he won't vote for a health care bill that doesn't work for Montana. "I need to know that, in fact, it'll bring premiums down, preserve rural access and protect people with pre-existing conditions," he says. He also says he would have voted against the House health care bill, because there wasn't enough time to read and understand it before the House voted. Democrats, however, accuse Gianforte of being disingenuous. They point to a recording of a phone call he had with lobbyists on the day the House bill passed, which was leaked to The New York Times. On the tape he can be heard saying, "Sounds like we just passed a health care thing, which I'm thankful for, that we're starting to repeal and replace." Democratic candidate Rob Quist pounced on those words. Quist needs Republican votes to win, so he's trying to convince Republicans that their candidate will sell out the state's interests on health care. "Montanans want a Congressman who'll shoot straight, not a dishonest politician who says one thing to Montanans and another to the millionaires behind closed doors," he says. Quist says he wants to build on the ACA and thinks the country should eventually move to a single-payer health insurance system. This story is part of a reporting partnership with NPR, Montana Public Radio and Kaiser Health News. A previous version of this story misspelled the last name of restaurant owner Molly Galusha as Galush.